This section lists the secure certificates installed in the load balancer in order to be used in LSLB farms with HTTP profile and HTTPS listener and behave as a SSL Offload virtual service, including certificates for SSL and CSR. Common Name. Single host name or wildcard name for a wildcard certificate. Click to see the certificate. Type. Certificate file type. It can be Certificate or CSR. File. Certificate name ended with .pem or .csr extension, a descriptive text to identify the certificate in the future. Issuer. Certificate authority that has signed the certificate. This does not apply to CSR files. Status. Color to show the current status of a certificate: Valid (Green), Expired (Red), Will expire soon (Yellow). Created on. From this date on the certificate is active. For a CSR file, is the date when the request was made. Expire on. Is the date when the certificate will be expired. It does not apply to CSR files. Actions. You have available the actions per certificate: download and delete. The delete action is not possible for the default certificate (zencert.pem). Upload certificate. Show a form to upload a certificate file in PEM format. Generate CSR. 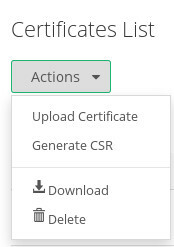 Show a form with the details required to generate a CSR file. Download. Download the selected certificates. Delete. Remove the selected certificatse. Next step, Generate a CSR certificate.